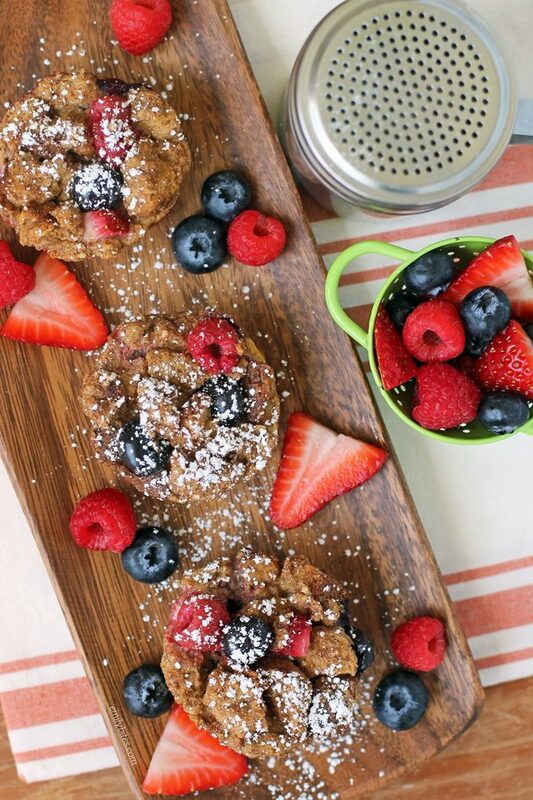 If you’re looking for a tasty, easy brunch idea, these Berry French Toast Muffins are for you! Mother’s Day is coming and I think these would be a great way to show mom some love. I based these off of my Apple Streusel French Toast Muffins and I don’t know which one I love more! 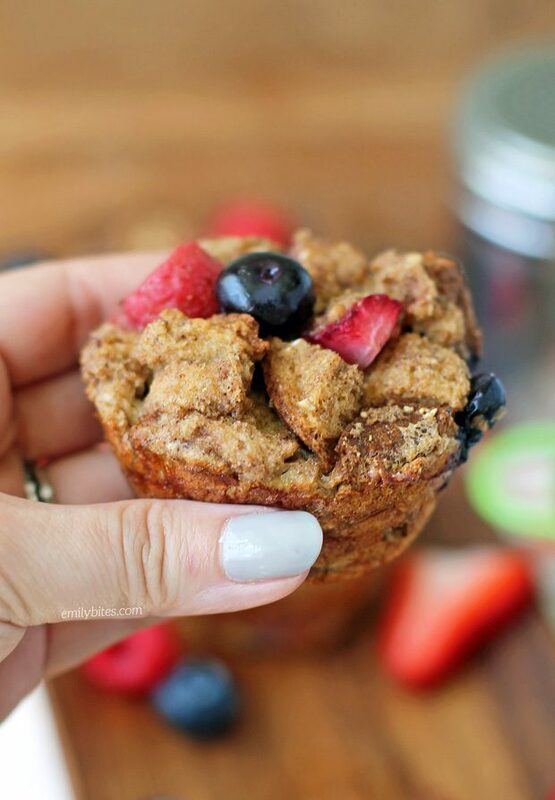 They’re like personal-sized cups of French toast casserole and they’re only 96 calories or 2 Weight Watchers SmartPoints each. The juicy bites of berry throughout these cups are a real treat and you can use whatever combination of berries you like best. These Berry French Toast Cups are perfect on their own with the sprinkle of powdered sugar, but you can also add butter or syrup as you might with traditional French toast if you prefer. 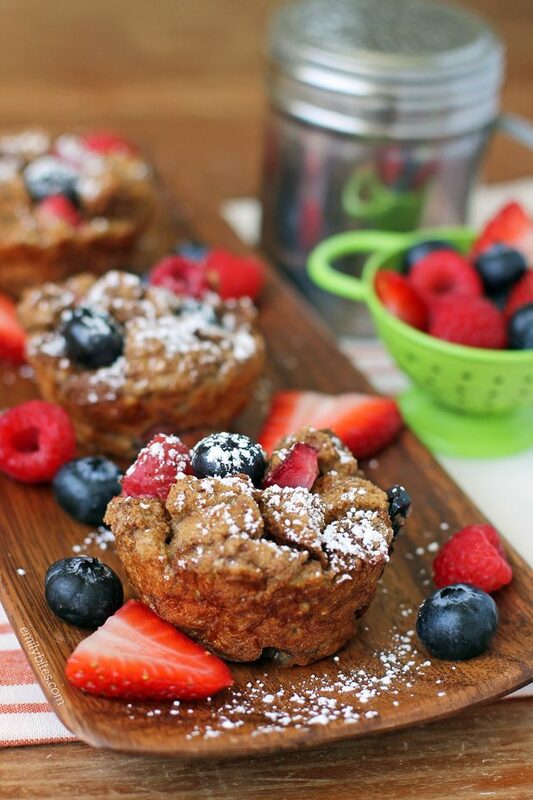 Looking for more tasty and portable breakfasts you can make in your muffin tin? Try my Ham and Cheese Egg Cups, Pear Gingerbread Baked Oatmeal Singles, Mini Dutch Baby Pancakes, Blueberry Baked Oatmeal Singles, Sausage Egg and Cheese Hash Brown Cups, Pumpkin Chocolate Baked Oatmeal Singles, Lemon Blueberry Muffins, Bacon, Egg and Cheese Biscuit Cups, Banana Chocolate Baked Oatmeal Singles, Banana Pancake Bites and many more in the breakfast section of my recipe index! Pre-heat the oven to 350. Lightly mist 12 cups in a standard muffin/cupcake tin with cooking spray and set aside. In a large mixing bowl, whisk together the eggs, egg whites, milk, vanilla extract, sugar and cinnamon until combined. Add the cubed bread pieces and stir together until the bread has soaked up the liquid in the bowl. Stir in the berries. Spoon the mixture into the prepared muffin tin press down lightly on each to form them together. Place the tin in the oven and bake for 25-30 minutes until the French toast muffins are cooked through and the tops are golden. Allow to cool for a few minutes and remove from the muffin tins. Sprinkle with the powdered sugar and serve. These were incredible- my house smelled amazing while they were baking. I have been craving french toast all week and was going to make a Weight Watchers french toast recipe tonight but when I saw these I knew I needed to try these instead. Very, very yummy! Made these and the Tortellini Soup last night to prep for my week. Didn’t have the strawberries or raspberries, just blueberries, so I doubled the blueberries called for. I had a tester right after they were done before boxing them for my mornings and they are delicious! This morning it was a bit stiff from the fridge so I put a wet napkin over and popped it in the microwave. Came out perfect and topped with a little drizzle (1 tsp) sugar free syrup gave it that extra special French toast flavor. Thank you for this great recipe! It will definitely put into my rotation. Although I haven’t tried this yet, it looks like a recipe I would love. These look like just what I was looking for to replace breakfast sweets. Unfortunately when I did the Calculate a Food, it came up to 3 WW points, not 2. I’m just starting, so 1 point can be a big deal. With recipes it is best to use the WW recipe builder as it doesn’t count the values for zero point foods (like fruit or eggs). Of course these foods still have calories, carbs, fat, etc so if you enter the nutrition info into the points calculator you will get a different SP total. Hope that helps! How should I store these? Do they need to go in the fridge since they have eggs in them? Eek! We let them cool overnigh not in the fridge. Still good? Hi Emily, Do I need to use paper or foil liners in my cupcake pans?